Background: Appropriate resuscitation of hypoxic patients is fundamental in emergency admissions. To achieve this, it is standard practice of ambulance staff to administer high concentrations of oxygen to patients who may be in respiratory distress. A proportion of patients with chronic respiratory disease will become hypercapnic on this. Objectives and methods: A scheme was agreed between the authors’ hospital and the local ambulance service, whereby patients with a history of previous hypercapnic acidosis with a Pao2 >10.0 kPa—indicating that oxygen may have worsened the hypercapnia—are issued with “O2 Alert” cards and a 24% Venturi mask. The patients are instructed to show these to ambulance and A&E staff who will then use the mask to avoid excessive oxygenation. The scheme was launched in 2001 and this paper present the results of an audit of the scheme in 2004. Results: A total of 18 patients were issued with cards, and 14 were readmitted on 69 occasions. Sufficient documentation for auditing purposes was available for 52 of the 69 episodes. Of these audited admissions, 63% were managed in the ambulance, in line with card-holder protocol. This figure rose to 94% in the accident and emergency department. Conclusion: These data support the usability of such a scheme to prevent iatrogenic hypercapnia in emergency admissions. Ensuring adequate oxygenation in the acutely unwell patient is important in stabilising their condition. This is recognised by the “ABC” algorithm for prioritising resuscitation in critically ill patients.1,2 Oxygenation may be compromised by problems with airways (A) or breathing (B), or indeed at tissue level by problems with circulation (C). It is therefore standard practice of ambulance staff to administer high concentrations of inspired oxygen (Fio2) to patients who may be in respiratory distress. The Department of Respiratory Medicine at Southend Hospital and the Essex Ambulance Service therefore devised an “alert card” system to identify individuals known to be at particular risk of retaining carbon dioxide on high Fio2 in order to control oxygen administration on future admissions. We have now audited the scheme to assess its effectiveness. 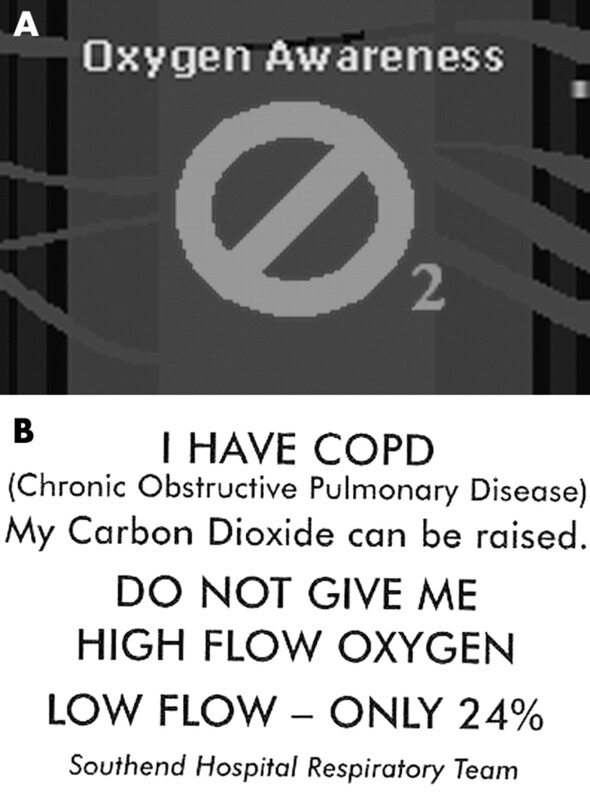 Patients admitted with hypercapnia following administration of high concentrations of oxygen are issued with a laminated card (credit card sized) bearing the “O2 Alert” symbol (fig 1) and a 24% Venturi mask. Card holders and their families are instructed to show these to emergency staff on subsequent admissions. Ambulance crews and A&E staff are guided by a protocol to limit their oxygen provision to an Fio2 of 24% until the patient has been assessed by a doctor, whose decision should be guided by ABG measurement on arrival to A&E. An “O2 Alert”’ warning sticker with the same design as on the alert card is fixed to the front of the patients’ notes as a further warning. The Southend oxygen alert card: (A) front and (B) reverse. The system was introduced in the summer of 2001. Card issuing is activated by medical staff and coordinated via an experienced clinical nurse specialist (LW). After three years we conducted an audit of the scheme in terms of number of cards issued; baseline characteristics of patients involved in the scheme; survival since card issued; number of readmission episodes; and adherence to protocol during these readmissions. Ambulance sheets, A&E records, and medical admissions notes were reviewed to gather this information. We analysed the ABG measurements by regression analysis with robust standard errors, allowing for data clustering (multiple readmissions by the same patients). A total of 18 patients (mean age 64.4 years (SD 13.3); 11 men) were issued cards over the audited period; 14 card holders were readmitted on 69 occasions. Sufficient documentation for auditing purposes was available for 52 of the 69 episodes. Of these audited admissions, 63% (33/52) were managed in the ambulance, in line with card-holder protocol. This figure rose to 94% (49/52) in A&E. The mean forced expiratory volume in one second (FEV1) was 0.71 l (SD 0.36) and the mean forced vital capacity (FVC) was 1.53 l (SD 0.45). ABGs of 34 of the 52 readmission episodes (65%) were documented in the notes. Mean ABG values for pH, Pao2, and Paco2 are shown in table 1. 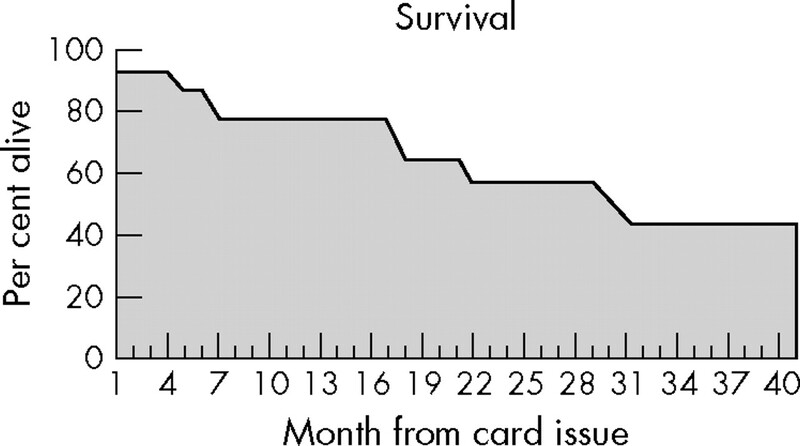 Mean survival since card issue was 20 months and 50% (9/18) were still alive (range of survival 2–40 months; fig 2). In six cases all supplemental oxygen was removed for a period in A&E in order to obtain an “on air” ABG measurement despite significant hypoxia. This occurred in 3/20 in the group in which the alert card protocol was followed and in 3/14 in the group in which the alert card protocol was not followed. The major finding of our study was that “O2 Alert” cards can be successfully used in patients at known risk of hypercarbia when Pao2 exceeds 10 kPa. Among the cardholders, 63% of readmissions were managed according to protocol in the ambulance, rising to 94% in A&E. At readmission the mean ABG values indicated trends to severe hypercapnic respiratory failure, suggesting that patients had been correctly identified as an “at risk” group for this. Our comparison group was historical and the comparison is qualitative, insofar as we know that prior to the scheme’s introduction all episodes would have been managed in the ambulance with oxygen flowing at 15 l/min via a simple face mask. We therefore believe the scheme can be judged effective. Our study was only intended to look at the effectiveness of our oxygen alert card scheme. This scheme presupposed that the case was made for avoiding the administration of high Fio2 to patients with exacerbation of COPD clearly shown to be “at risk” of hypercapnic acidosis (Pao2 >10 kPa). We recognise that many other important issues are raised whenever delivery of controlled Fio2 is considered. It would, for example, be useful to know whether an alert card scheme of this type was associated with other measurable benefit (for example, mortality, length of hospitalisation, requirement for invasive or non-invasive ventilation). Our study was not designed to evaluate these, and the numbers enrolled on the scheme were insufficient for such purposes. Thus although the patients managed according to protocol were less acidotic the size of the difference was not statistically significant for the small numbers involved. Other difficulties that would have to be surmounted to design a study to assess such outcomes effectively include defining an appropriate control group. Denying some patients identified as susceptible to hypercapnic acidosis from being cardholders and thereby increasing their risk of receiving high Fio2 to generate a control group could well be regarded as unethical. However, a historical control group from prior to the scheme’s introduction or from a hospital not using such a scheme would be of arguable relevance for a quantitative study. The scheme described here is only applicable in controlling supplemental oxygen delivery in those patients in whom supplemental oxygenation has previously been demonstrated to be associated with respiratory acidosis (pH ⩽7.35) in the presence of a Pao2 >10 kPa. By definition therefore at least one such event will have occurred in these patients. We have chosen to use a 24% mask in preference to a 28% mask. We recognise that it is debatable which initial Fio2 is the safer in those known to be predisposed to respiratory acidosis. Moreover, the risk of underoxygenating critically ill, hypoxic patients is a major and valid concern of many commentators.10,13,14 Our data do not demonstrate any clear underoxygenation of those admissions managed on-scheme as opposed to those managed off-scheme. However the numbers involved are too low to draw statistically significant conclusions beyond this. In three cases out of the 18 in which controlled oxygen was not given this was probably appropriate—in these cases the notes indicate the patient was in extremis with severe hypoxia. A number of other issues arise from this study. Rather alarmingly, six cases were identified in which all supplemental oxygen had been removed for a period in A&E in order to obtain an “on air” ABG measurement despite major hypoxia. We do not believe this was a direct consequence of this scheme as it occurred marginally more often when the scheme was not being adhered to. Instead we suspect that it reflects A&E staff misunderstanding the rationale for a “baseline ABG” or a confusion with the way in which ABGs are measured when assessing suitability for long term oxygen treatment. This is an area where more education is required and has been instituted. As only 18 cards were issued over the three years studied, it seemed unlikely that all cases of hypercapnic acidosis secondary to high Fio2 were being picked up in this way. We have since altered our practice to make referral for consideration for card eligibility more automatic for anyone admitted with ABGs showing a pH <7.36, Paco2 >6.5 kPa and Pao2 >10 kPa. A further improvement to the scheme has been achieved by cross-referencing the list of “O2 Alert” cardholders with the ambulance service database. The scheme discussed here is simple and effective in limiting the administration of high Fio2 in COPD patients already known to be at risk of significant hypercapnic acidosis. It did not appear to be associated with adverse consequences in our small study group. There is a need for universal guidelines for emergency oxygen which ensures adequate but not overly aggressive oxygenation in COPD, and such guidelines have been produced at local levels.16,17 The scheme we have described could be added to any universal scheme and may be useful in the national guidelines for emergency oxygen which are currently being drawn up. The authors are grateful to Dr A Hutching of Southend Hospital and the London School of Hygiene and Tropical Medicine for his invaluable statistical advice. Warrell D, Cox TM, Firth JD, et al. The clinical approach to the patient who is very ill. In: Warrell D, Cox TM, Firth JD, et al, eds. Oxford Textbook of Medicine. Oxford: Oxford University Press, 2004, Chapter 16,. McQuillan P, Pilkington S, Allan A, et al. Confidential inquiry into quality of care before admission to intensive care. BMJ1998;316:1853–8. Donald KW. Neurological effects of oxygen. Lancet1949;ii:1056–7. McNicol MW, Campbell EJM. Severity of respiratory failure. Arterial blood-gases in untreated patients. Lancet1965;13:336–8. Plant PK, Owen JL, Elliott MW. One year period prevalence study of respiratory acidosis in acute exacerbations of COPD: implications for the provision of non-invasive ventilation and oxygen administration. Thorax2000;55:550–4. Westlake EK, Simpson T, Kaye M. Carbon dioxide narcosis in emphysema. Q J Med1955;24:155–73. Jeffrey AA, Warren PM, Flenley DC. Acute hypercapnic respiratory failure in patients with chronic obstructive lung disease: risk factors and use of guidelines for management. Thorax1992;47:34–40. Denniston AKO, O’Brien C, Stableforth D. The use of oxygen in acute exacerbations of chronic obstructive pulmonary disease: a prospective audit of pre-hospital and hospital emergency management. Clin Med2002;2:449–51. Barr J, MacNee W. Acute on chronic respiratory failure: deleterious effects of high flow oxygen therapy [abstract]. Thorax1999;54 (suppl 3) :152. Gomersall CD, Joynt GM, Freebairn RC, et al. Oxygen therapy for hypercapnic patients with chronic obstructive pulmonary disease and acute respiratory failure: a randomised, controlled pilot study. Crit Care Med2002;30:113–16. Wolstenholme RJ, Pilling A, Bassett C. Letter. Clin Med2003;3:183–4. Durrington HJ, Flubacher M, Ramsay CF, et al. Initial oxygen management in patients with an exacerbation of chronic obstructive pulmonary disease. Q J Med2005;98:499–504. Singer M, Bellinghan G. Letter. Clin Med2003;3:184. Skowronski G. Letter. Clin Med2003;3:184–5. National Institute for Clinical Excellence. Chronic Obstructive Pulmonary Disease. National clinical guideline on management of chronic obstructive pulmonary disease in adults in primary and secondary care. Thorax2004;59 (suppl. 1) :i1–i132. Murphy R, Mackway-Jones K, Sammy I, et al. Emergency oxygen therapy for the breathless patient. Guidelines prepared by North West Oxygen Group. Emerg Med J2001;18:333–9. Howard LS, Harrison BD. Oxygen therapy in COPD, 2002. E-letter linked to: Murphy R, Driscoll P, O’Driscoll R, Emergency oxygen therapy for the COPD patient. Emerg Med J2001;18:333–9. This work was not submitted to any local ethics committee for approval. Emergency Medicine Journal 2006; 23 587-587 Published Online First: 20 Jul 2006.